Taking a cruise from Port Canaveral and looking for an easy place to stay before your trip? As one of the busiest cruise ports in the world, it’s a popular point to sail to the Bahamas and the Caribbean. That’s why all the major cruise lines sail from Port Canaveral, giving plenty of options for a stay. The biggest negative about Port Canaveral is its location. Situated about 45 minutes from the Orlando airport you have to find transportation to the port before you can start your trip. The good news is that a number of companies have sprouted up offering shuttle services from the Orlando airport to Port Canaveral. As well, some hotels in Cocoa Beach (the town next to the port) also offer easy shuttle services from the airport. Once you are near the port, there is no shortage of hotels that offer shuttles to the cruise terminal. While many of these shuttles are included for free with parking packages, you can request a ride anyway even if you don’t book the package. It may cost a nominal amount ($6-10) but is well worth it. Below, we’ve arranged two groups for cruise passengers. The first are hotels in the area with shuttle service to the Orlando airport and the port. 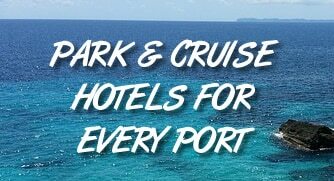 The second are hotels that offer transport to the cruise terminal only. Click each link to read real reviews from travelers like you on TripAdvisor. More Hotel Ideas: You can also click here to see hotels near Port Canaveral (potentially without shuttles) or see “Park and Cruise” hotels in the port area. The following hotels offer shuttles between the Orlando airport and their hotel, along with a shuttle to and from the terminal. The rides are free when included in the package price. Situated in the heart of Cocoa Beach, the Comfort Inn is right near the water and only a 10-minute ride to the cruise terminal. In other words, the location is ideal for anyone wanting to spend some time in the area before their cruise. The hotel offers a Fly, Snooze & Cruise package that runs as low as $195 per night. This includes a standard room, along with free round-trip transport from the Orlando airport to and from the hotel. It also includes a shuttle round-trip to the cruise ship. This hotel offers a great location between the main road through Cocoa Beach and the beach itself. Guests are only an easy 10 minutes from the port and a short distance away from restaurants and things to do. Like the Comfort Inn, the Courtyard offers a Fly, Snooze & Cruise package with prices around $225 for a Saturday night stay. The package offers transport from the airport to the hotel and then to the cruise port. After your cruise, you’ll be given a ride back to the airport. Within walking distance of the Cocoa Beach Pier (and a Publix grocery store for any last minute needs), the Best Western is just about 4.5 miles (< 10 minutes) from the cruise terminal. The hotel offers a shuttle from the Orlando airport as part of a package, along with a ride to/from the cruise terminal. You have to call the hotel to book the deal: 321-783-7621 Ext. 2490. Looking for an affordable option? The Econo Lodge offers a package that starts at just $180 and includes free transportation to the hotel from the airport. On the day of your cruise you’ll have a shuttle ride to the cruise terminal, as well as transport back to the airport when you debark from your trip. Service to other area airports like Sanford and Melbourne is also available. Note that the Econo Lodge is on Merritt Island — between the mainland and the beach and about 20 minutes from the cruise port. Call 321-735-8831 to book. Just a block from the ocean, the Days Inn is in the heart of town and near a number of restaurants and things to do. We found rates for a Saturday night stay around $160 during a recent search. But the hotel has a Fly, Snooze and Cruise package for $278. The package includes transportation to and from the Orlando airport and to and from the cruise port. If you don’t need a ride to the airport, there is also a shuttle available to the ship for $7 per person. It runs three times a day, at 10:30, 11:30, and 12:30. No matter what sort of package or service you need regarding a cruise from Port Canaveral, the Quality Inn & Suites has you covered. First, if you are flying into Orlando they offer a Fly, Snooze and Cruise package. This includes transportation to and from the airport and a shuttle to and from the cruise port. For two people, this package costs about $130 above the base room rate. If you don’t need a ride from the airport, they also offer a package with a shuttle to the cruise port for about $20 over the base rate. This hotel is a short 2-minute walk to the beach, and you don’t even have to have a car to get to your room. If you fly into Orlando International, then the airport offers transportation options. For a single person there is a $24 fee (each way) to get from the airport to the hotel. If you want to travel in style, you can get a Lincoln Town Car for $100. Once you are ready to head to the cruise ship, there is also a shuttle offered for $10 per person each way. For a great all-around hotel, it’s hard to beat Hampton Inn. If you are flying into Orlando and need a shuttle to the port, the option gets even more attractive. During our search, we found a base rate around $235 for a Saturday night stay. The hotel offers a “Fly & Cruise” package for $300 ($65 more). The package includes a round trip shuttle from the Orlando airport and the cruise port for one person. An additional person is $45 more. If you just want a shuttle to the cruise port, it’s $7 one way, and $12 round trip. There are three departure times each morning. While only a few hotels offer packages with shuttles from the Orlando airport to Port Canaveral, many more offer parking packages with shuttles to the cruise terminal. If you like, you can arrange your own transportation to the area and then hop on one of these shuttles to and from the cruise port. Since most people book parking packages with free transportation included, you might have to pay a small fee ($5-10) to take the shuttle without the package. If you book a package, your ride will be included for free with your fare. Note: If you don’t plan to park a car during your cruise, don’t book a parking package just for shuttle access. It’s much more expensive. While the name my sound old-fashioned, the Country Inn & Suites is a clean and modern hotel just a couple of miles from the port. While it offers a parking package with an easy shuttle to the cruise terminal included, you don’t have to book that package to get transportation. A shuttle ride to the port is only $5 per person. If you need a ride to the port, this represents one of your closest options — just minutes from the ships at Port Canaveral. The hotel offers a shuttle for just $5 per person each way. Departures leave three times during the morning to take you to the terminals. Simply let them know you want a ride when you check in. As with many hotels in the area, the Radisson caters to cruisers. It includes parking packages and a shuttle to the port. However, not every hotel can offer the resort style feel and attractions. The shuttle is $10 per person, but kids six years and under are free. It also runs every 30 minutes, so you can leave whenever is convenient for you. Cocoa Beach has a lot to offer and is one of the most popular spots in the state. If you plan to enjoy the beach before your trip, then you might like a hotel that’s a little farther from the beach (and more in the heart of the action). The Holiday Inn Express offers a parking package with parking and cruise shuttle included. If you just want a ride to the port, it’s $7 per person, leaving at 10:30 a.m. In the heart of Cocoa Beach, the La Quinta Inn is a good option for those wanting affordable accommodations near the port and the beach. If you are parking then you can get a parking package that includes a shuttle. Otherwise, it’s $8 per person ($16 round trip) for a lift to the port. Weekdays the shuttle leaves at 9:30 to take you to the ships. There are two departures on weekends (9:30 and 10:30). The Four Points by Sheraton is in the heart of Cocoa Beach, and just a short walk to the sand. They offer a shuttle service to the port for $10 per person, with three departure times — 10:15, 11:15, and 12:15 — to get you to the ship. Simply let the staff know at check-in and they can get you registered for your ride to the terminal. One of the most enviable locations in all of Cocoa Beach, this La Quinta sits on the beach right near the town pier. It’s a great option before a cruise, and if you need a ride to your ship, they have you covered. A shuttle leaves the hotel at 10:30 and noon. The cost is $7 per person. While the prices are a little higher, this hotel features suites, great reviews, and is among the closest hotels to Port Canaveral. If you need a shuttle, then it costs a reasonable $5 per person. The shuttle leaves once a day, and you just let the staff know at check-in that you would like a ride. Not looking for anything fancy? Want to save your money for the ship? The Motel 6 might be one of your best Cocoa Beach options. You can get a shuttle to the port for just $7 per person. The ride will only take about 10 minutes, meanings it’s pretty quick to the port as well. If you need a ride to the port, the Hilton Oceanfront offers trips for just $5 per person, with two departure times — 10:30 and noon. The hotel is also among the best reviewed (4.3 stars on Google) and just about 15 minutes from the terminals. Keep in mind this list isn’t exhaustive. If you find a different hotel that you like, simply ask if they offer shuttle service to Port Canaveral. Odds are they do. Are shuttle rides roundtrip between the hotel and the cruise port? While a number of hotels do offer roundtrip service, some offer only one-way trips. Any package you book will tell you clearly if the ride is roundtrip. If not, you’ll need to arrange alternate transportation to wherever you need to go. There are a number of affordable transport options between Orlando and Port Canaveral that we’ve covered here. If I need to shuttle to the airport, what’s the earliest I should book a flight from Orlando? Many people fly in for their cruise from Port Canaveral and then fly out the day the cruise arrives back in port. To allow plenty of time, we suggest giving yourself at least an hour after arriving to get off the ship and another hour to shuttle to the airport. We also suggest giving yourself at least two hours before your flight. So if your ship arrives at port at 8:00 a.m., the earliest (and it still cuts it close) we’d suggest a flight is 12:00 p.m. For more on when to schedule your flight after a cruise, read our article here.